Just when you thought we were moving along and laying the sordid past to rest (at least until June, when Jerry Sandusky’s trial is scheduled), ESPN’s Outside the Lines comes along with a detailed, behind-the-scenes investigative account of Joe Paterno’s dismissal after a 61 year tenure at Penn State. The story, by Don Van Natta, Jr., also appears in the April 16, 2012 “One Day, One Game” issue of ESPN The Magazine. The following paragraph gives you a portent of the story. Through it all, the central character was Corbett. “Something not very good happened,” he told reporters on Nov. 9, hours before he urged his fellow trustees to fire Paterno. “We have to … take the bull by the horns and fix it. 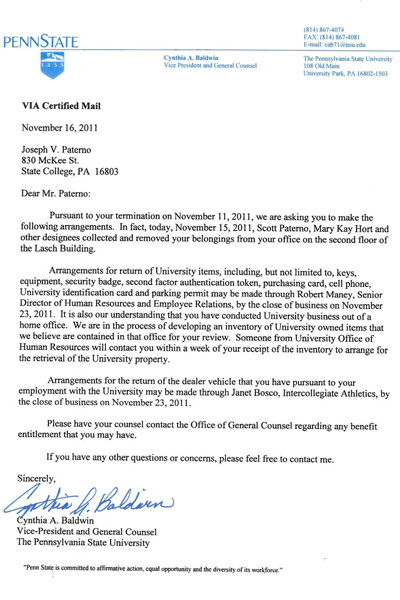 Quickly.” Publicly, Corbett made it clear that he thought he was the most qualified person to fix Penn State. Corbett had his comeuppance as attorney general of Pennsylvania, where his reputation was formed in bringing down powerful people. Old instincts don’t die easily. Read the ESPN article. It is lengthy and it rubs salt in old wounds, but a thorough understanding of the circumstances can only serve to assuage some of the pain. Or not. Let me begin by offering Sue and my prayers for all of the people impacted by these events. I know it is small comfort given the circumstances. I also understand that there are a lot of questions regarding the events involving former assistant coach Jerry Sandusky, Tim Curley and Gary Schultz. However, because of the status of these ongoing legal matters, I will not speculate or answer questions about the charges or the people involved beyond this brief statement. As the Grand Jury report notes, I was subpoenaed last January to testify regarding an incident in 2002. As my very brief testimony established, my role was limited to a single report made to me by an assistant coach in 2002. The coach in question came to my house on a Saturday morning and informed me that he witnessed former coach Jerry Sandusky in a shower with a young boy. The coach made it clear that he felt strongly that there was something inappropriate going on and that he was very upset by what he saw. The coach made no specific allegations of any identified sexual act, nor did he use any graphic terms – just the idea that what he saw was wrong and that he did not know what to do next. At that time I told the coach that he had done the right thing and that I would take the appropriate next step. After consideration I determined that, given Sandusky’s status as a retired employee governed by a retirement package negotiated with the administration, I had no authority to act directly. The next day, in accordance with University policy, I contacted the head of my department and related what was told to me. That was the last time the matter was brought to my attention until this investigation and I assumed that the men I referred it to handled the matter appropriately. I know that there are many other questions that people want to ask, but I ask that we all be patient and give the judicial process time to do its deliberate work. Finding the truth is what will benefit the victims most of all, and that is who we should all keep in mind as we deal with this tragedy. In order to give that process adequate time I will not be answering any questions on this matter, nor will I have further comment, until the legal process is completed. This statement was probably the work of Joe’s son Scott, who is an attorney. I don’t believe that there is anything particularly new or revealing in it, as it was obviously meant to be an indication that the matter would be kept under wraps due to the pending investigation. Joe did, however, explain that he washed his hands of it when he reported it to his department head the next day. Assume? You know what they say. That’s all behind us now. When I saw the leaked statement, I had to choose between leaving sleeping dogs lie and sharing it with you dawgs. I chose the latter.